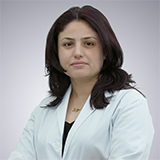 Before joining Fakih IVF in Abu Dhabi, Dr. Katty worked for 6 years in private practice and at the American University Hospital in Beirut, Lebanon. She has experience in dealing with complicated Obstetrical and Gynaecological cases and was responsible for delivering over 500 patients a year. Dr. Katty has great experience in dealing with complicated infertility cases since she was a resident at the American University of Beirut - Medical Centre. The diversity of patient cases she has come across gave her a wide spectrum of different approaches. In addition, her university hospital position enriched her clinical capabilities and sense within the Obstetrics and Gynaecology and Reproductive Medicine fields. Dr. Katty has extensive experience in normal and high-risk pregnancies, ultrasound, Endoscopy and Hysteroscopy. Her special interests lie in Infertility and Reproductive Medicine and is currently working under the close guidance of Dr. Michael Fakih. Education: Graduated from the American University of Beirut with honours. Achievement: Ranked among top five students in Lebanon and the first in AUB-MC for the years of her training.